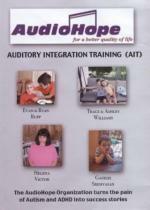 There is new hope for the treatment of autism and ADHD through auditory integration training. Learn about these success stories by the AudioHope Organization. PLEASE NOTE...This page is to be discontinued as soon as the current stock is exhausted. See how the AudioHope Organization turns the pain of Autism and ADHD into success stories! Through a 10-day treatment program, auditory integration training helps remove the obstacles affecting an autistic or ADHD child to move them toward a full and normal life.